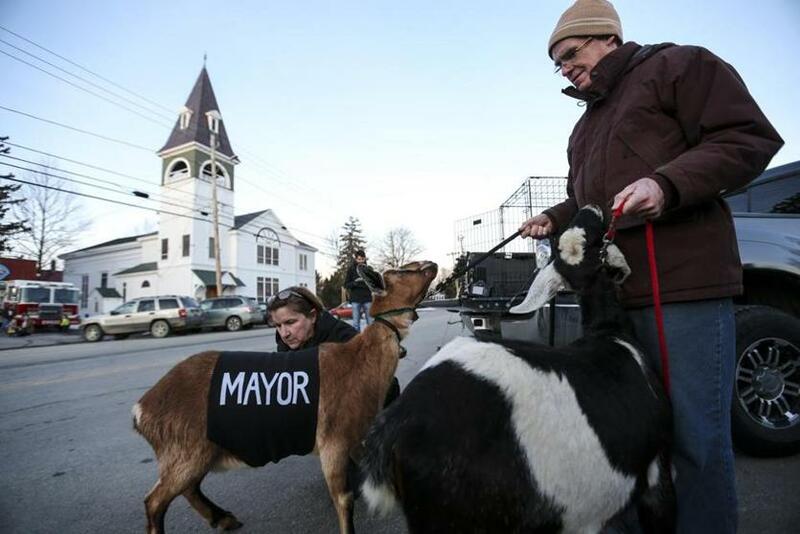 Lincoln, a 3-year-old Nubian goat, was sworn in as the mayor of Fair Haven, Vermont, on Tuesday evening. FAIR HAVEN, Vt. — When she had finished relieving herself on the hallway floor, the newly elected mayor stepped forward, gathered herself, and strode purposefully into the Town Hall meeting room, ready for her big moment. It was a Tuesday night, and the new mayor — a 3-year-old, droopy-eared Nubian goat named Lincoln — had drawn a crowd. A few dozen townspeople had packed into the small space for the goat’s official swearing-in. Camera-wielding TV reporters jostled for position. Others craned their necks for a look at the animal draped in a mayoral sash and wearing a bell collar. 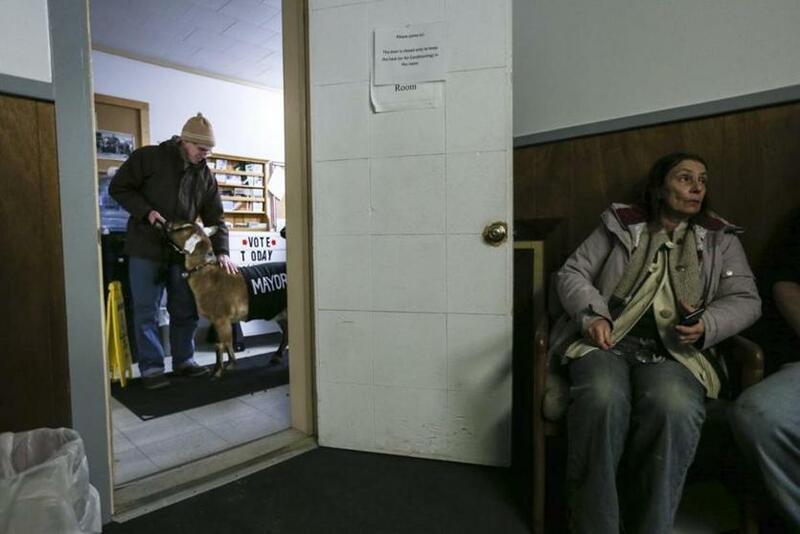 Since the goat’s March 5 election, this is pretty much how it has gone — in this bedroom community of 2,500 people in western Vermont, and far beyond. Town Manager Joe Gunter has taken dozens of calls from media outlets across the world, from Fox News to The Japan Times. The idea for an honorary pet election had been Gunter’s, a way to raise money for a new playground, and Lincoln the goat beat out a crowded field of 16 local candidates that included a dog named Sammie and a gerbil named Crystal, this despite a limited political background and no discernible platform. Each entrant paid a fee that went toward the playground. In fact, folks in town, which is run by a Board of Selectmen, seemed to know very little about their newly elected leader. They knew the goat belonged to the Stanton Family, out on Scotch Hill Road. And that it was a working-class goat, purchased by the Stantons — Chris and Sally — two years ago expressly to munch the brush on a 1-acre stretch of their property. Sally Stanton, left, put a sash embroidered with the word "Mayor" on Lincoln before the official swearing-in ceremony. Most residents couldn’t say whether the mayor-elect was a fire-breathing conservative or — ahem — a bleating-heart liberal. But this has not stopped them from having strong feelings about the goat. 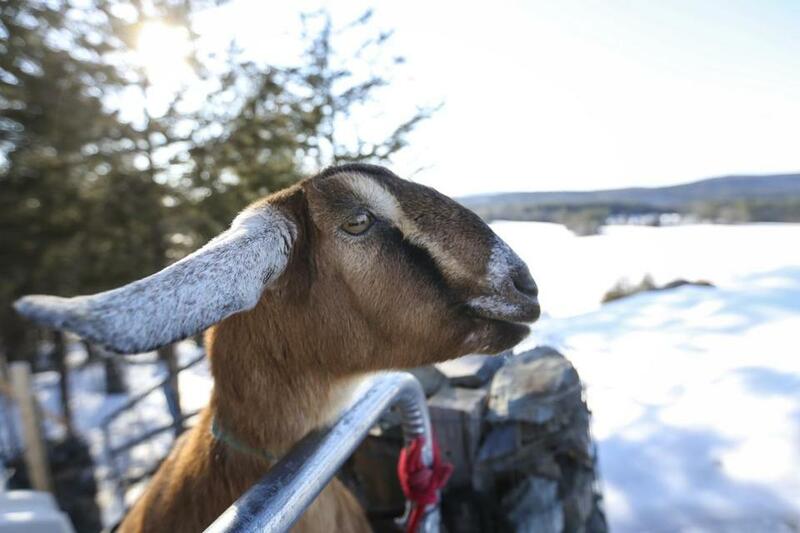 Since her photo first appeared on the front page of the nearby Rutland (Vt.) Herald, talk of the goat has dominated conversation at the Kinder Way Café downtown, and over at the Wooden Soldier, a diner that locals call “Town Hall West,” where a ham-salad sandwich goes for $5.75 and the opinions come for free. “Oh my God, it’s so stupid,” grumbled Cindy Seamans, as she bustled behind the counter ahead of the lunch rush. “I think [the goat’s] cute,” replied coworker Cathy Monty. Although the town’s four-legged mayor has certainly made waves, such an election is not without precedent. In 2011, a cow named April was elected mayor of a small Washington town. And in Minnesota, a Great Pyrenees dog named Duke recently wrapped up a four-year run as mayor of the town of Cormorant. Both mayors reportedly served their respective constituents well. But there have been cautionary tales, too, particularly when it comes to goats. 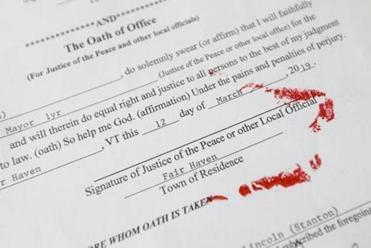 Lincoln’s hoof-print signature adorns the oath of office. In the early 1980s, a black mountain goat named Clay Henry became an overnight sensation when he was named mayor of the small Texas town of Lajita. People traveled from across the country to have a beer with the mayor — or, more precisely, to feed beer to the mayor, who quickly developed a drinking problem. One night, in a Shakespearean twist, the drunken mayor found himself locked in a physical altercation with his son, Clay Henry Jr., over the attentions of a female goat. By the time it ended, the mayor was dead, and today his stuffed head adorns the wall of a local bar, a not-so-subtle reminder of the perils of power. By all accounts in Fair Haven, Lincoln is cut of more substantial cloth. True, she has been known to escape from her pen occasionally and wander over to the Stantons’ big back deck, peering into the family’s windows. And, like many politicians, she has never met a camera she did not want to spend considerable time in front of. But stationed inside her pen the night before her swearing-in, nibbling on pellets and curiously eyeing a visitor, she seemed an easygoing and well-adjusted goat. The ceremony went well enough, apart from the “accident” in the hallway that sent William Humphries, the local police chief, in search of a broom. “Not the first time I’ve been pooped on by a town official,” he said. As Lincoln entered the meeting room, the few dozen townspeople crammed in and clapped respectfully. The town clerk stood at the front. An oath of office was read. The goat stamped her inked hoof to the oath, making it official. Soon there would be civic duties — parades and apple festivals are on the schedule — but that would come later. Now, as cameras flashed and the townspeople beamed, Lincoln strutted outside toward a waiting pickup truck, looking hungry. Chris Stanton and Lincoln prepared to walk into a room in the Fair Haven Municipal Building for a ceremony to be sworn in as mayor.